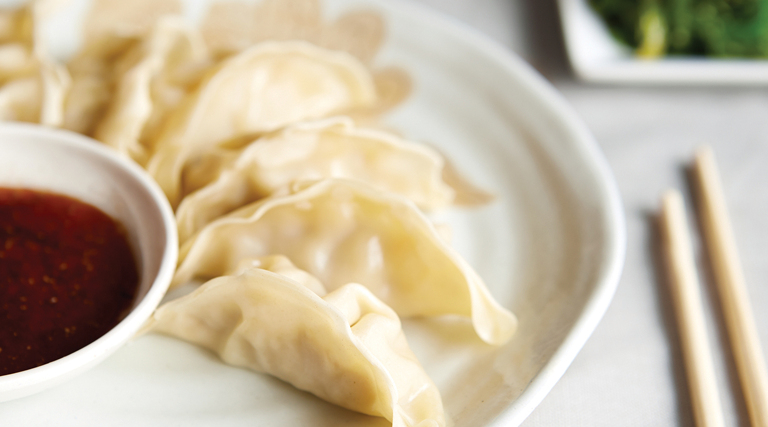 Whether you call them momos, potstickers or dumplings, one thing is for certain: They are delicious. Stuffed with meat or vegetables, dumplings have long been a community staple loaded with good fillings and good fortune. In the Chinese culture, dumplings are one of the most important foods made and eaten during the Lunar New Year—symbolizing wealth and celebrating bringing the family together to make them. Some say that the more dumplings you eat, the more money you can make in the new year—and who wouldn’t take that chance if it’s only a matter of eating another delicious dumpling! Here in Salt Lake City, a new dumpling delivery service, Happy Dumpling, is owned and run by Kate Stalsberg, a Utah-trained chef, and Rabin Gurung, a native of Darjeeling, India. This husband and wife team brought their culinary training and heritage together into one delicious package this past August when they began making dozens of dumplings to deliver to Utahns. Dough for each dumpling is rolled and pleated by hand by Gurung—who says he’s been practicing the art for 31 years. Additionally, all five sauces that are served with every momo are housemade in the commercial kitchen the couple rents each Thursday. If you’re a fan of spicy condiments, try the Ama G’s salsa, an adaptation of Gurung’s mom’s version that features five cups of a chili native to Darjeeling with heat comparable to habanero peppers. Once all the dumplings are built, they are cooked, cooled and packaged in a reuseable container. Happy Dumpling orders include 20 dumplings and two 2-ounce sauces. The dumplings can be microwave steamed in the provided container, pan-fried or deep fried. To place an order for delivery, visit the website and choose from beef, pork or vegetable dumplings and two of five sauces including Ama G’s salsa, tangy ginger soy, spicy garlic soy, spicy peanut or sweet and salty peanut. Orders can be delivered from 300 West to Wasatch Boulevard and South Temple to 9600 South on Friday or Saturday between 10 a.m. and 2 p.m., or 2-6 p.m.